Energas Technologies recently commissioned a fuel gas receiving station for a new 340 MW power plant in the coastal city of Tema in Ghana. According to the company, the power plant has been designed to run predominantly on natural gas, but can also operate on distillate oil and light crude oil. 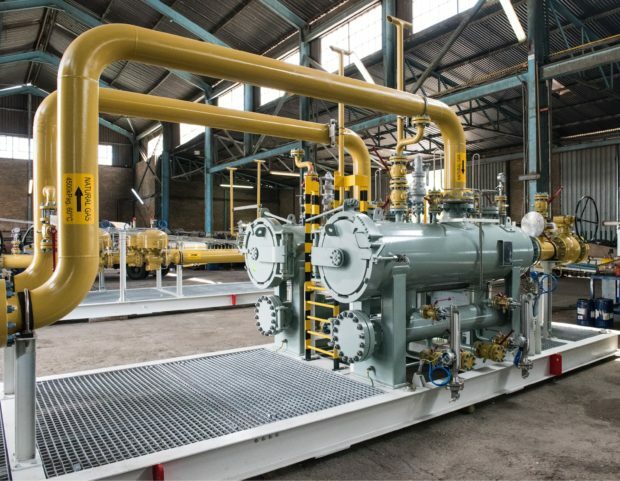 The fuel gas station takes natural gas from the nearby pipe network and treats it before delivery to the plant’s gas turbines. The commissioning activities involved verifying all instrument loops, testing all safety systems, verifying the accuracy of the flow meter, commissioning the water-bath heaters and correct adjustment of the pressure regulators and slam-shut valves. Nitrogen was used to purge the piping to an acceptably low oxygen concentration prior to the introduction of natural gas. The post Fuel gas receiving station commissioned appeared first on EE Publishers.